Professional voice recorder with touchscreen, slide-switch operation, Wi-Fi and camera available now. The SpeechAir PSP2200 has just arrived. The new recorder features three professional microphones optimized for high-quality voice recording, is Wi-Fi-ready and comes with more battery power and an all-improved camera. “The Philips SpeechAir is the perfect voice recorder with Wi-Fi. It is the ideal tool for any business, legal or healthcare professional looking to save time by recording their voice instead of typing” explains Dr. Thomas Brauner, CEO of Speech Processing Solutions. The 2nd generation Philips SpeechAir Smart Voice Recorder comes with new features, such as an even more powerful hardware, a longer lasting battery and an increased Wi-Fi range. The device now also comes with an improved camera for better photos and even quicker barcode scanning. The new Dictation Mode allows a user to disable all functions and keys irrelevant for dictating to his or her employees, letting them focus on recording only. The gorilla touch screen and shockproof housing combined with the carefully designed ergonomics make the Philips SpeechAir ultra-durable and suitable for even extended daily use. 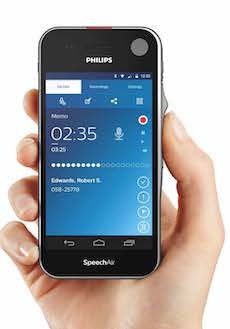 “Philips SpeechAir meets all the demands of a professional and mobile voice recorder. Users can save time by working on the go from virtually anywhere.” adds Dr. Brauner. “We take data security very seriously. This is why both our Philips SpeechAir as well as our workflow and transcription software live up to the highest security and data privacy standards. Dictations are encrypted in real-time using 256 bit technology and the device itself can be protected through an individual password, pin or pattern” adds Dr. Brauner. The new power saving feature enables users to define a time, after which the device turns itself off automatically, if left idle. This is useful for both battery saving and security reasons. The dictation recorder is easy to integrate into users’ IT infrastructures, and works in harmony with existing software, both in large hospitals or small businesses. Thanks to its Android operating system, third-party apps can be effortlessly installed on the device, allowing for customization of the device to meet each company’s demands. 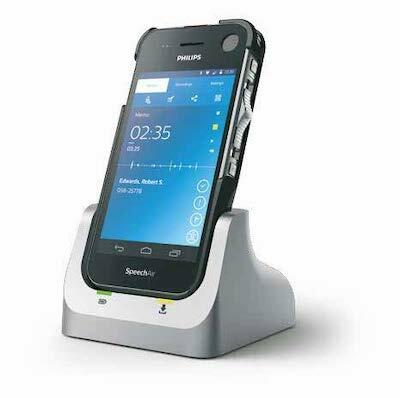 The SpeechAir Smart Voice Recorder is ideally suited to be combined with a workflow solution such as Philips SpeechLive, which enables users to send their dictations directly to trained transcription professionals and receive their transcribed files back to their device quickly. Need a demo? Contact us now to arrange an obligation-free demo on any of our Philips products and let us show you how much more productive and efficient you can be. Previous articleSabinet sponsoring 40 Attorney Development Fund beneficiaries.